Those were the days when Grandpa Clemens would call our landline phone and say that the new baseball cards had arrived. Tyler and I would drop everything, grab our bikes, and take off peddling at top speed, orange safety flags whipping in the wind behind us, as we b-lined across town. We’d arrive, out of breath and panting, grab a Coca-Cola and a freshly baked cookie from Grandma, and sit Indian style on the living room floor waiting for Grandpa’s delivery. He would bring out two large shipping boxes and we’d rip them open like it was Christmas morning. Inside would be boxes and boxes of brand new, unopened packs of Bowman, Pinnacle, Topps, or Upper Deck baseball cards. These were the kind of boxes that you’d see in grocery stores where little boys begged and pleaded with their mothers to buy just one pack. We didn’t have to beg. We had not only one or two packs each, but entire boxes of packs to open. Tyler and I would spread them out on the floor around us and tear into them, box after box. Oh the smell of freshly printed ink on heavy cardstock and the sound of the foil wrappers tearing off the unknown treasures inside! We’d scan the cards, mostly looking for special inserts like numbered cards, autographs, or jerseys, and whoop and holler when we found one. We’d both look over the insert, guess how much it might be worth, and move on to the next pack, hoping for another pot of gold. Grandpa would sit in his easy chair and watch with pleasure, knowing that when the excitement was over, Tyler and I would take off with the highly coveted insert cards and leave the regular cards with Grandpa so he could painstakingly organize them by number and build complete sets for both of us. Twenty years later we have accumulated containers and containers (and I’m talking the large, 20 gallon plastic tote tubs) of baseball cards. Enough to fill two closets and part of the garage in Grandpa’s condo in Arizona. Then Grandpa said it, “Maybe you should sell all of those baseball cards.” Sure thing Grandpa, should be no problem! No problem was an understatement. I have spent the last 10 years telling people that me, Tyler, and Grandpa each have 10,000 cards, thinking that was a rather large collection. I way underestimated that number. This spring we brought 6 tote bins back to Santa Barbara and I started the arduous process of selling them. First a set at a time, then two at a time, then as many dang sets as I could fit into a flat rate shipping box from the post office. Everything was uploaded to eBay and priced very competitively. It quickly became apparent that no, we would not be buying a house with the proceeds from baseball card sales (and that comes from a guy currently living in a van that cost less than $10,000). A brief moment of disclosure. While it sounds like I’m saying baseball cards are worthless, there are actually cards out there that are pretty valuable. It just happens that I don’t own any of them. I did get lucky once. I listed two sets of early 1980’s Topps cards for $20 and a few people bid them up to $75! But, that only happened once. The rest of my cards sold for barely more than the postage expense, and a few times I miscalculated the freight and the cards actually sold for less than what it cost to ship them. In those cases, I was literally paying someone to take the cards from me. From the 1940’s – 1970’s little boys collected baseball cards for fun. Everyone was doing it. There wasn’t much value to the cards unless you cared, or wanted a stick of gum. Then, when the wave of parents started cleaning out attics and throwing away their kids’ baseball card collections, the law of supply and demand kicked in. Suddenly, there were fewer cards in circulation, and more of them in the dump. That made them valuable, incredibly valuable. The next obvious step is those kids grew up and had little boys of their own. The dads never forgave their parents for throwing out their fortune in baseball cards and they decided their kids would reap the benefits of their lost investment. So, they bought baseball cards for their sons, lots of them, and told them to keep them forever so they could sell them someday and buy their dream house. So, we did. All of us. Again, the law of supply and demand kicked in. The market is now flooded with baseball cards from the 1980’s on, sometimes called the “Junk Wax Era”. No one really wants to buy them because they already have them. Maybe not the greatest investment. 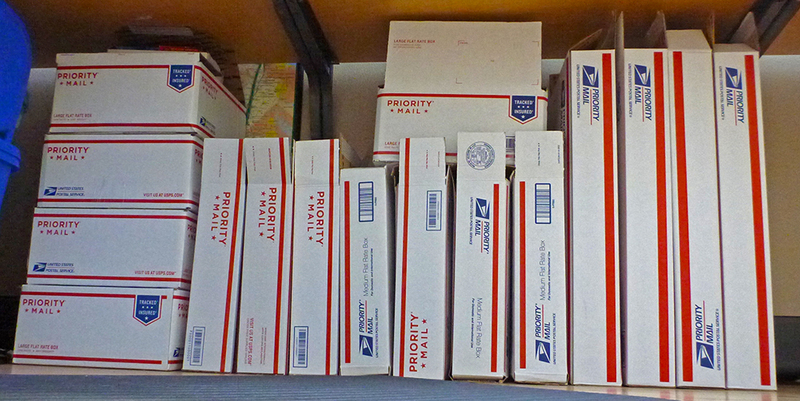 So, when I say I sold my baseball card collection, what I really mean is that I pretty much gave it away. 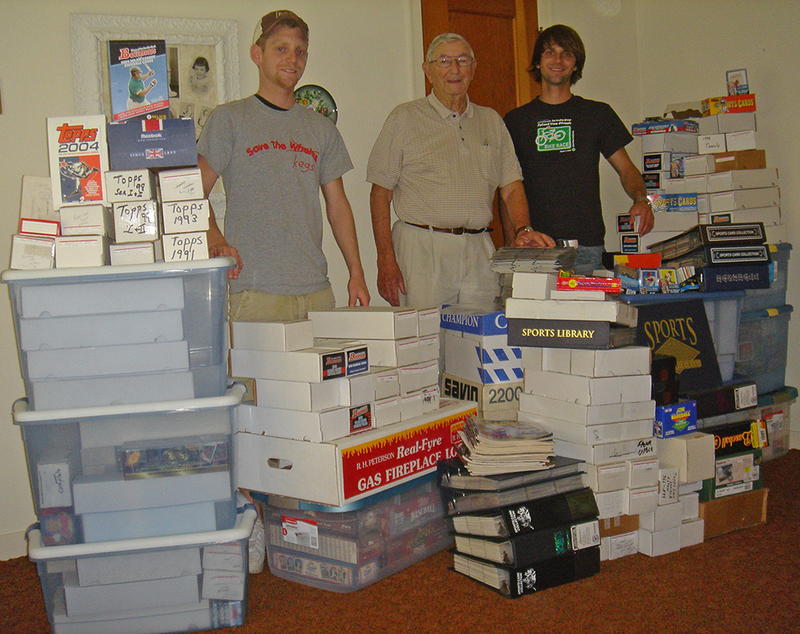 It “cost” me 12 hours one weekend to list more than 30,000 baseball cards, just a sixth of what we still own, and I only “made” a few hundred dollars in proceeds. This, of course, still doesn’t count the raw cost that Grandpa paid to buy them in the first place. But, in reality, it was never about the investment. It was about the experience. The real value can be measured in the countless hours that we spent with our Grandpa on Saturday afternoons pouring over thousands of baseball cards. The excitement we felt when we got the phone call from him. The joy that he shared with us each time we opened a new pack of cards. 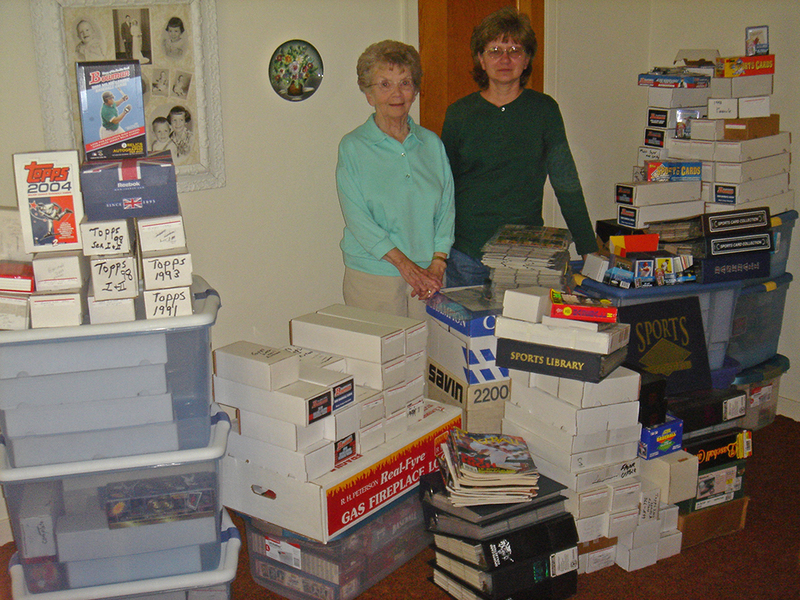 The way that Grandma dreaded that new shipment of baseball cards, but looked forward to having us over to open them. That time, that friendship, that happiness…that is something that can’t be bought or sold on eBay. It’s not about how much profit we make from the “sale” of our baseball card collection because we have already reaped the profit by building the collection with Grandpa. On that note…if anyone is in the market to buy baseball cards, let me know…we still have well over 150,000 cards that we’d like to “sell”! I have come across close to 25,000 somewhat vintage baseball cards. Meaning dating back to Don Sutton Nolan Ryan exedra. A friend friend died of cancer in 2000 and left these for him. Do not know anything about them but I’m learning quickly. Help me Obi-Wan Kenobi you’re my only home run I hope. Mike, that’s a lot of good cards! They are a little older than the ones I had, so you might be able to get more for them. I’d start by visiting a local baseball card dealer and discussing options. I used eBay for simplicity, but it’s not the best way to get the full value out of them. I was in more of a hurry to unload them and enjoyed passing them on at a great price to buyers who were sharing the love of cards with their kids and grand kids! Good luck!